Restorations and teeth can change over the years. This patient had 20-year-old veneers and wanted to refresh her smile. After the patient and Dr. Radu reviewed digital photos taken of her mouth, they came to the joint conclusion that straightening the patient’s teeth was a good place to start and chose Invisalign® clear aligners to do the job. When the Invisalign treatment was complete, Dr. Radu placed new veneers on the patient’s upper front teeth. The entire process took about a year, and this very discerning patient was quite pleased with the results. This 50-year-old man had orthodontic treatment in another office a couple of years ago but was not happy with the result. Dr. Radu created a new plan using Invisalign® clear aligners, and after about six months the patient had a pleasing esthetic result. An important benefit of straight teeth is improved periodontal (gum) health. This young man had a healthy set of teeth, but was unhappy with how crooked they were. Dr. Radu extracted all four wisdom teeth and used Invisalign for about eight months to achieve a beautiful smile. 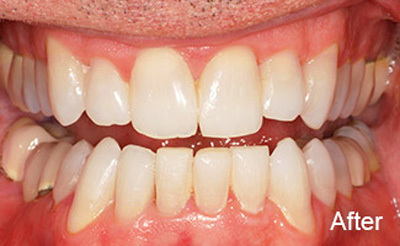 This 40-year-old patient had a healthy set of teeth, but her bite was off and esthetically, her smile was far from perfect. Her teeth were leaning, the midline was off, and her teeth were caving in at the middle of the arch. Dr. Radu planned an Invisalign® treatment, and in about a year, all the goals he and the patient had planned were achieved. Most importantly, her bite is good and she can smile with confidence now. The bite and esthetics of this case were complex. Dr. Radu had expected that this very busy executive would choose the fastest solution for his smile and bite issues. However, when presented with the options of Invisalign or veneers, he chose the longer road of Invisalign® treatment. The straightening procedure was followed by bleaching and conservative composites on some teeth. The result is a huge improvement of his bite and overall smile! This woman in her 30s wanted to change her smile, but thought she couldn’t afford to because, in her words, “Cosmetic dentistry is very expensive.” Dr. Radu was able to make her dream of having a beautiful smile possible, by creating a multi-stage treatment plan. The full mouth restoration was done in several stages, starting with the front teeth, first lower, then upper. Dr. Radu created a functional bite, and made the patient’s teeth beautiful, as well as more stable, by using veneers and full porcelain crowns bonded to her teeth with strong cement. This 30-year-old man suffered from chipped and heavily discolored upper front teeth, due to an imperfect enamel formation. His bite was also very far off. Dr. Radu analyzed his bite with the T-Scan and evened it out, as a first stage of treatment. After trying the new bite with a temporary restoration, a set of beautiful porcelain crowns for his upper front teeth was created by our skilled laboratory in Germany. The patient was so happy and confided in us that, “He never could smile before, and now he can.” A rather limited number of porcelain restorations created a total makeover. A previous dentist told this patient that his upper teeth could never be repaired because they were too frail! Dr. Radu needed to do some periodontal treatment and was able to save the patient’s teeth. After that he restored the unsightly old composites and crowns with new, beautiful full porcelain zirconia crowns. This middle-aged man had been using chewing tobacco for many years and his teeth were almost completely worn out. He wanted a complete makeover and also wanted at least one gold area showing! Dr. Radu used strong porcelain fused to gold crowns and bridges, for longevity, function and to fulfill the patient’s desired esthetic wish. Many years of neglect led to what the patient considered a “disastrous situation.” This 50-year-old thought all her teeth would have to be extracted. However, through careful planning and root canal therapy, Dr. Radu was able to save enough teeth to support upper and lower partial dentures that rest on precision attachments. These dentures look, feel and act like natural teeth and the patient was ecstatic with the result! This patient had been troubled all her life by the unsightly gaps between her teeth and at age 35, she decided to have this flaw corrected. The two options for treatment were Invisalign® clear aligners or porcelain veneers. The amount of space that needed to be closed, as well as the size and the proportion of the teeth made veneers the best choice. Dr. Radu’s thorough computer planning and the artistry of the ceramist made this case an esthetic success. The patient had a lifelong dream fulfilled in three weeks! This patient of ours was away at college when he broke his teeth in an accident. He flew to Boca Raton to have Dr. Radu provide a temporary fix for his broken front teeth, and then flew back three weeks later to have thin conservative porcelain veneers permanently bonded in place. This young professional had badly worn teeth, and she wanted to have this condition repaired. Dr. Radu diagnosed the cause of the wear to be a result of the patient grinding her teeth. He explained to her that treating the cause first is the correct approach, because if any restorations were placed prior to treating the grinding, they would eventually be destroyed. Dr. Radu worked for about four months to even out the patient’s bite, through the use of a therapeutic night guard, before proceeding with the restoration of the worn teeth. A rather conservative approach was possible, due to thorough planning. With only four minimally invasive porcelain veneers, bleaching and reshaping of certain teeth, the result was stunning! Dr. Radu has treated this patient for about 25 years. After years of conservative treatment, she decided that she wanted to stop the wear and thinning of her upper front teeth and asked me about her choices. Together, we decided to protect her upper six front teeth with porcelain veneers, which were tinted to match her other teeth. Her smile has been esthetically improved; however, in this case, function was the primary consideration. This 17-year-old soccer player lost her upper front tooth after a traumatic blow to her face. Dr. Radu placed a single dental implant, and once the implant had healed, he capped the implant post and abutment with a full porcelain crown for the best cosmetic result. This patient has had many dental problems over the years, and in her early 50s, she decided to finally address her bite and smile. She had several dental implants placed by another dentist and they were healed and ready to receive restorations. However, she was very unhappy with the fit and look of the temporaries the dentist had provided. She came to Dr. Radu to ask if he could make a better temporary for her. Dr. Radu likes a challenging case, and he meticulously analyzed the situation, contacted the other dentist, and received permission to take over the case. The result was a beautiful restoration with a strong, functional bite and great smile. Dr. Radu used a combination of zirconia porcelain crowns, fixed bridges supported by natural teeth and dental implants. This 80-year-old man had untreatable abscesses and extractions were required. Rather than get a removable partial denture, he chose the option of having four dental implants placed because they are more comfortable and function like natural teeth. After three months, the implants had healed and Dr. Radu placed the permanent restorations. To achieve a better bite, the rest of his upper teeth were capped with porcelain zirconia crowns. The result is not only esthetically pleasing, but also functional, and he can now eat the foods he needs to remain healthy. Dr. Radu believes that function, comfort and esthetics are important at any age. After wearing and disliking a removable partial denture for about 10 years, this 60-year-old woman decided to have dental implants placed. The implants allowed her to get rid of the partial denture covering the roof of the mouth, be much more comfortable and enjoy a strong bite. She can chew better; she doesn’t need to constantly worry about removing and cleaning the partial; the implant-supported zirconia porcelain crowns function just like natural teeth. Sometimes old restorations simply wear out and need to be renewed. Such was the case with this 65-year-old patient who wanted a more youthful look. Dr. Radu needed to replace her restoration, as it was over 15 years old. The original implants were kept, but he placed new hardware and new upper and lower esthetic reconstructions that are supported by the implants. This patient had lost of all her teeth at a young age and had received a fixed restoration supported by dental implants. The implants were placed over 25 years ago and were still in great shape. Dr. Radu replaced the restoration, giving her a more youthful smile. After an accident, this 40-year-old woman lost her upper front teeth. Dr. Radu and his team placed implants in strategic sites and a temporary partial was used while the implants were healing. Dr. Radu placed a permanent porcelain zirconia bridge for the final restoration. In just four months, her smile and dental function were regained! This wife of a retired dentist had several crown and bridge restorations done over the years. When she came to our office, she needed a new plan for the upper teeth because the restorations were falling apart. Dr. Radu and his team placed a few new dental implants to augment the implants she had placed 20 years ago and completed a full upper set of fixed porcelain bridges. She was very happy to avoid a removable denture and have a set of functional and beautiful fixed bridges. This 60-year-old patient was missing a lot of her back teeth. Dr. Radu and his team placed nine implants in total (upper, lower, right and left) to replace the missing teeth, and created a comfortable new bite, so the patient can now chew anything she wants. She also wanted her old front crowns replaced and he used full porcelain zirconia crowns for her upper and lower front teeth, to complete a functional bite and esthetically pleasing smile. When this 50-year-patient came to our office, she’d had some implants placed and restored in another office, but wasn’t pleased with her restoration. Dr. Radu designed and created a new cosmetic restoration. The patient received a fixed full porcelain zirconia layered bridge, which was cemented over her implants. When none of her lower teeth could be saved, this 70-year-old woman had the options of a full denture, or dental implants capped with a fixed restoration. She chose dental implants. On the day Dr. Radu extracted her teeth, he and his team placed six implants and immediately fitted a fixed restoration over the implants. This is possible when the implants can be placed in strategic positions and are all connected with a complete strong framework under the set of teeth. Many patients learn to live with their loose dentures, as was the case with this 60-year-old with a full upper denture she’d worn for many years. When facing the loss of her lower teeth, the unpleasant thought of yet another unstable removable full denture influenced her decision to have dental implants placed. In one day Dr. Radu and his team placed six upper and eight lower implants and restored both upper and lower with fixed restorations! Many times people opt for this scenario, going through more extensive work in one day, rather than having to come back for multiple appointments. In a single day, she went from a loose upper denture and a failing set of lower teeth to two fixed, comfortable, functional and beautiful restorations! After getting several second opinions from several dentists, this young 65-year-old decided to have all her upper teeth removed and replaced with an all-implant supported restoration (Stable Teeth Today). This case was complicated due to the large number of missing teeth, and even more teeth needed to be extracted due to infections. She wanted a fixed restoration to take the place of her old, unstable, removable partial denture. With extensive planning, using the iCAT and study models, Dr. Radu completed the intermediate fixed restoration in one day. Six months later, he completed the final restoration retained on eight implants. This retired professional decided he’d had enough of his old upper denture and lower failing teeth and decided to have a fixed-implant-supported upper and lower restoration. Dr. Radu did this in two phases – first the upper, then the lower – over the course of 14 months. The result is a healthy mouth and the patient can finally chew his food properly. Incidentally, the procedure also restored his smile! When this teacher retired to Boca Raton a couple of years ago, she asked her previous hygienist for a referral. It happened that her previous hygienist, now located in Boston, had worked in our office several years ago. The hygienist told the newly retired teacher what a great office we have and she decided to come in for a consultation. Dr. Radu needed to extract her few remaining teeth to give her the fixed set of teeth she wanted. Based on the cone beam 3-D x-ray, five implants were strategically placed and the restoration was screw-retained on the same day (Stable Teeth Today). Five months later, he completed the new permanent restoration and a new upper denture. Her chewing ability has improved considerably, and her smile is much more attractive.